benefits of mudra | do yoga! When we sit either to calm ourselves at the beginning of practice or to rest in between asana, I often suggest a mudra for your hands. The term mudra means gesture or attitude and besides those using the hands there are also whole body, mouth and eye mudras. Mudras are part of the subtle body of yoga practices, they are lesser known than the physical asana (postures) and are based on the principles of Ayurveda which is a healing practice often considered yoga’s sister. I find it helps to consider the body in the Eastern mindset – thinking about what we call alternative health practices such as acupuncture or reflexology. With these practices the energy pathways are massaged or redirected and mudras work in the same way – holding the fingers in a variety of ways to enliven or redirect the flow of energy around the body. 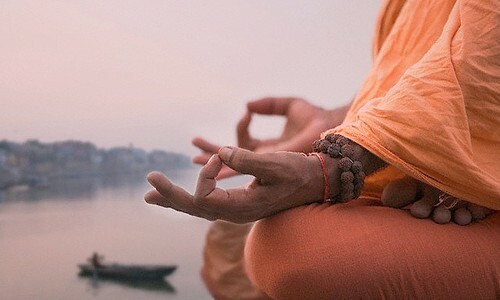 Relating directly to the ‘pranic flow’ and the nervous system, mudras create a subtle connection with the patters in our brains to influence the unconscious reflexes in the desired areas. Our internal energy is in turn balanced and redirected to affect a change in the sensory organs, glands, veins and tendons. You do need to be ‘tuned’ in to your body which requires a year or two of consistent yoga practice and also the ability to sit still or hold postures so that you can add this extra dimension of subtlety to your yoga practice. Here are 2 practices involving mudra for you to try. 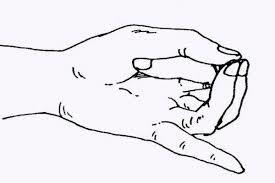 Sit in a comfortable posture and hold the mudra for 5 -15 minutes. Can you notice any changes in your body or mind? Can you tell the difference between these 2 mudra? Apan Vayu Mudra – pictured below, is said to affect the heart. Here the middle finger and ring finger lightly connect to the thumb, with the index finger folded inwards and the little finger stretched outwards. You can accompany this mudra with the following affirmation – “I have the time and the leisure to see beauty and enjoy the silence”.